The cytology brushes are primarily used to collect cell from various parts of human body such as gastrointestinal tract and respiratory tract. It is used for the diagnosis of the various chronic diseases. The cytology brushes includes bristled brush matrix that is used to collect many cells at a time and maximize the cell sample for better diagnosis. The cytology brushes are available in different shapes and used for collection of cell samples such as body fluids, urinary sample and sputum samples. They are predominantly used in cancer screening processes. Cytology brushes are proposed for single use and diameters of brushes and size of catheters are available according to the clinical needs. The global cytology brushes market is anticipated to expand at a CAGR of around 8.0% during 2018-2027. It is projected to reach significant market size by 2027. The increasing cases of chronic disease across the globe coupled with rising number of patients reluctant to undergo biopsy in order to diagnose various chronic diseases. The global cytology brushes market can be segmented on the basis of product, application, end-user and region. On the basis of product, it is sub-segmented into plastic cytology brushes and metal cytology brushes. Metal cytology brushes are more preferred method of cytology on the account of ideal brush thickness and high cytological yield. On the basis of application, it is sub-segmented into oral, respiratory tract, gynecological, gastro intestinal, urinary tract and oncology. Oral sub-segment of the application segment is anticipated to grow at the fastest rate on the account of high popularity of oral cytology and also relatively less preference of consumers to undergo biopsy. Additionally, the increasing cases of oral cancer have augmented the use of cytology brushes throughout the forecast period. On the basis of end-user, it is sub-segmented into diagnostic centers and hospitals. Hospitals are the leading sub-segment in the end-user segment. The growing number of patients suffering from chronic disease coupled with high preference of patients for hospitals on the account of availability of enhanced equipment and experienced consultants. The increasing incidences of the chronic diseases across the globe are anticipated to be the major growth driver for the global cytology brushes market. The other growth driver includes less preference of patients for the biopsy test which is relatively expensive method of diagnosis. Cytology is cost effective method in comparison to other conventional sample collection techniques. 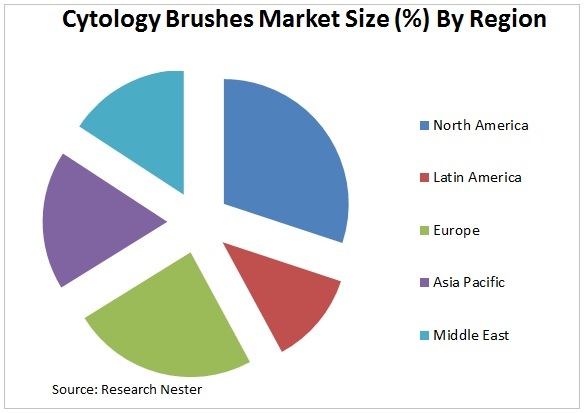 These factors are predicted to upsurge the market growth of the cytology brushes globally. Additionally, the rising per capita income is encouraging population to strive for better healthcare services is anticipated to propel the demand for the cytology brushes. However, lack of expert professional in order to complete sample collection is anticipated to be a major restraint for the global cytology brushes market during the forecast period.